Our Water Hookup Kit comes complete with everything you need to attach your Hydrofogger or Minifogger directly to your water lines. Kit can even be installed without shutting off the water! 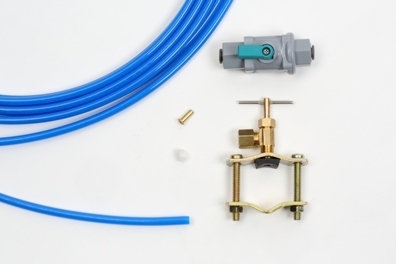 Kit contains a self-tapping saddle valve which taps directly into your existing water line. Comes also with compression union and flare to compression adapter. Also included is 25 feet of 1/4" Polyethylene tubing as well as a Shut-Off Valve. Shipping & Handling is free when ordered with a Hydrofogger or a Minifogger.